Zoe has an unconventional pen pal—Mr. Stuart Harris, a Texas Death Row inmate and convicted murderer. But then again, Zoe has an unconventional story to tell. A story about how she fell for two boys, betrayed one of them, and killed the other. Hidden away in her backyard shed in the middle of the night with a jam sandwich in one hand and a pen in the other, Zoe gives a voice to her heart and her fears after months of silence. Mr. Harris may never respond to Zoe’s letters, but at least somebody will know her story—somebody who knows what it’s like to kill a person you love. Only through her unusual confession can Zoe hope to atone for her mistakes that have torn lives apart, and work to put her own life back together again. When a complicated love triangle results in the death of one of the parties involved, British teenager “Zoe” is wracked with guilt, especially since no one realizes the part she played in all of it. Unable to keep it in anymore, Zoe ends up writing anonymously to Stuart Harris, an inmate on death row in Texas for killing his wife, figuring he will understand how she feels. As her letters, written at night in the backyard shed, proceed chronologically through the events leading to the fateful night, Harris’ execution inexorably nears. The whole concept of this novel put me in mind of John Marsden (a compliment). Initially, I thought of Letters from the Inside, though really the similarities are few between those works. More, this resembles something like So Much to Tell You or Winter, in which a teenage heroine attempts to get over a tragedy in her past that is gradually revealed to the audience. Pitcher does a good job maintaining the suspense, and at varying times I desperately wanted either to peek or not to peek at the ending. Better still, and like Marsden, the true focus here is on forgiveness and healing. I found Zoe a very appealing character, the funny and creative sort I would’ve liked to be friends with in high school. (Bonus points for owning a fountain pen!) True, she makes mistakes, but never does anything outright dumb. And I liked her family, too, particularly the bond between the sisters and the way in which Zoe realizes she’s got someone closer to home who can relate to what she’s going through. Another thing I really appreciated was how Zoe behaved around the two boys in her life, brothers Max and Aaron. She was never not herself, never downplayed her own interests and enthusiasms, and it was shown to be this quality that made her most attractive. The love triangle also didn’t resolve quite in the way I was expecting to, and while I mostly really like the ending, I will always be annoyed when a guy makes a decision on a girl’s behalf. 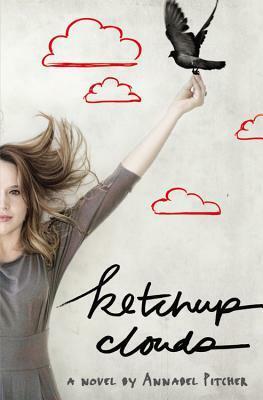 Ultimately, I liked Ketchup Clouds a lot. This was Pitcher’s second novel, and at some point I intend to check out her first, My Sister Lives on the Mantelpiece.